Knitted accessories are always favorites—to knit, to wear, and to give. 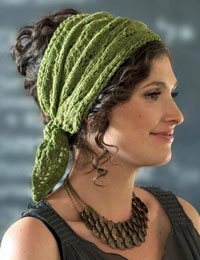 French Girl Knits' author Kristeen Griffin-Grimes is back with a new book, French Girl Knits Accessories. And oh, la, la, is it fabulous! Here are Kristeen's ideas about accessorizing effortlessly with your knits. To size up your accessories wardrobe and begin knitting garments you will truly treasure (and, ultimately, wear), let us reflect on the words of Madame Chanel: "Fashion fades, style is eternal." I hesitate to dispense fashion advice—I believe in everyone's right to dress exactly as they please with no interference from la police de la mode—so my thoughts on the subject are offered in the spirit of assisting you in honing your knitting choices. To develop your own sense of la mode in your knitting, begin with a study of not only what looks good to you but also what looks good on you. In the company of a sidekick for wise counsel, take some time to try on various styles of hats, wraps, or shrugs. Use a three-way mirror for viewing—it can be a real eye-opener! 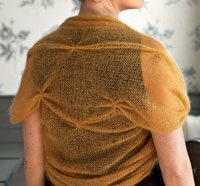 For myself, being of small stature with wide shoulders, raglan-sleeved sweaters, anything with horizontal stripes (as much as I dearly love them), giant cables, or too much fabric or fuss around my neck or front are definite no-goes. Simple fitted styles are best, even in scarves and headwear. I have loads of hair, so I look best in sleek designs that don't overwhelm. Much as I lust after giant cowls and wildly patterned shawls that appeal to my gypsy heart, they end up wearing me, instead of me wearing them! Take the time to assess your perks and peccadilloes—it will allow you to skip over a sea of designs that you know are not ideal. Uncover and play up your strengths and you'll be on your way to simplifying your knitting life. Don't settle for something that is simply functional—you can have your cake and eat it, too, in a warm hat that is super stylin', bien sûr! There are so many impressive patterns in this book, but one that really caught my eye is the Plume Anklets sock-knitting pattern. I just love the lace pattern, and the fact that they are anklet! Less knitting involved before the wearing can begin! Kristeen has a funny attitude about sock knitting, "The sock knitters among you may have to cover your ears for just a second—I had no desire to knit a single sock until I began writing this book. I know, such heresy . . . how could I not want to use those adorably tiny needles and divine hand-dyed yarns, not to mention experience the satisfaction of making, and then wearing, my very own chaussettes. I never understood the appeal until I began researching the subject. My goodness, such a wealth of knitting information and so many decisions to make: the myriad cast-ons, the heel choices, toe up or top down . . . where does one begin? Couple this with the portability angle and I finally get it—win-win!" I agree with her about the myriad options in sock knitting: yarn, needles, patterns; I think that's why I have so many single socks—I want to try something new! I should just start wearing the singles together as pairs. I could choose similar colors or something. Anyway, the Plume Anklets are knit toe-up and a variation is provided omitting the lace pattern from the heel and replacing it with a plain stockinette heel, which has a bit more durability than the lace heel. But I do love the fancy lace heel, so if I knit Plume, I'll be using it. Pre-order your copy of French Girl Knits Accessories today, or if you can't wait, download the eBook! P.S. What's your favorite kind of accessory to knit? Leave a comment and let us know!